Are you fed up with the same boring routine day after day? Do you feel like there is a more exciting or meaningful life you could be living? Would you like to start taking action towards your heart’s desires today? You need a bucket list – a written list of things you want to do before you die. 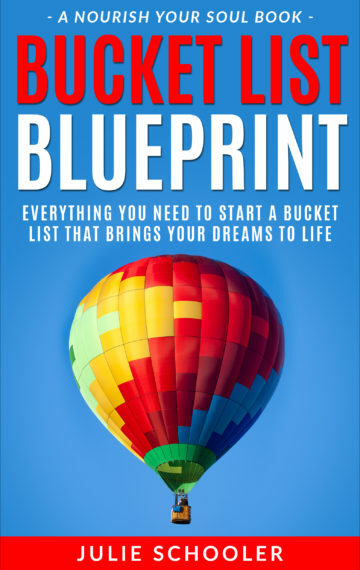 Bucket List Blueprint will give you practical advice to write the best bucket list personalized for your circumstances, and, most importantly, how to check off items so that you start bringing your dreams to life. This is the best book for anyone from 9 to 90 who wants to live a more fulfilling and fun life. There are tips and ideas that will suit any age, preference and budget–even if you have no money, no time and don’t want to travel. This book distills an avalanche of information plus insights from a challenge to check off 40 bucket list items in one year into simple and practical tips to help you write and take action with your bucket list. This is a short book but–and this is not said lightly–it will change your life. In less than a couple of hours this book will give you the exact blueprint to writing your own bucket list. Follow the simple steps in Bucket List Blueprint and you will give yourself the best gift of all–a fulfilling life. What’s stopping you from being the happy, energized and accomplished person you always thought you would be? Don’t wait until you almost ‘kick the bucket’ to read this book! Buy this book today and start living a breathtaking life where your long-held dreams turn into amazing memories. Bucket List Blueprint is part of the Nourish Your Soul series that shares delicious wisdom to help readers feel calmer, happier and more fulfilled.